As life expectancy for people with developmental disabilities increases, they are at higher risk to develop dementia. 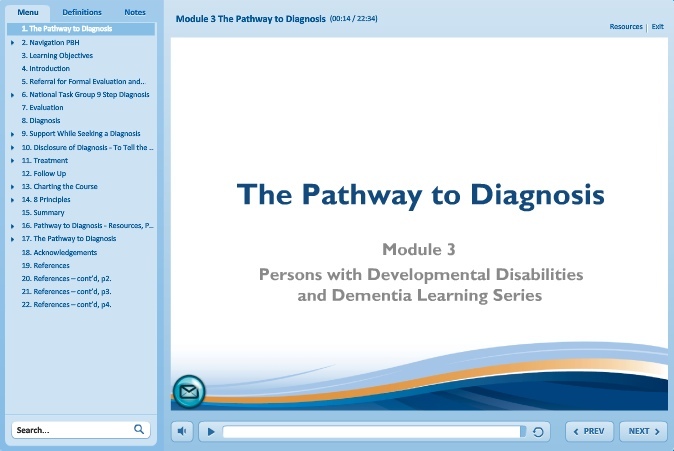 This four-part, on-line learning series introduces learners to the important topic of dementia in people with developmental disabilities. The learning series targets interdisciplinary health professionals, physicians, Community Living BC staff and Community Living Society providers who work with this population and who encounter dementia related issues for aging individuals. Learn more by exploring the full series below. You can work through each module at your own pace. The first module in this four-part learning series examines the relationship between chronic disease, brain health and dementia risks. 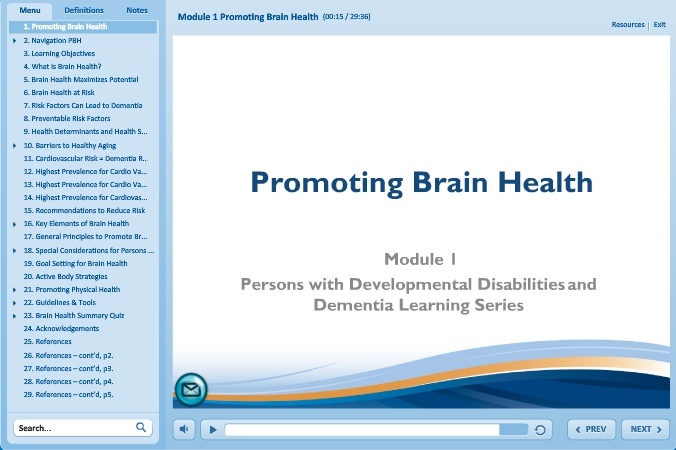 Learn how to assess risk factors and promote brain health strategies to reduce the risk of dementia for individuals with a developmental disability. Flash is required to view this module. 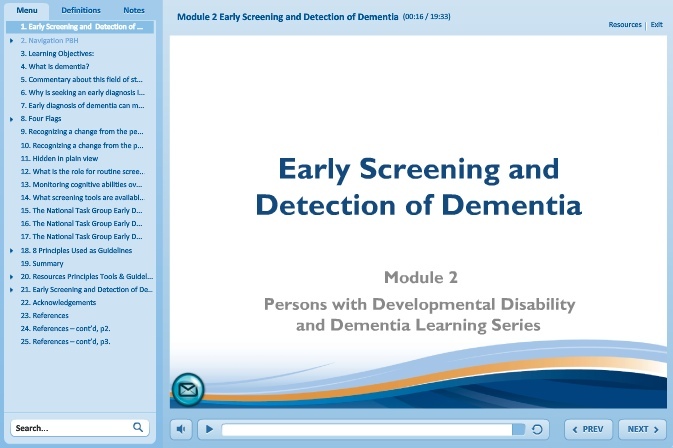 The second module in this four-part learning series identifies the four domains of early cognitive change (thinking, behaviour, function and mood), and provides practical screening tools for front-line providers to enable early detection and referral for diagnosis. Flash is required to view this module. The focus of this third module is on understanding the diagnostic pathway, and how to best provide support and information for the individual, family and their support network throughout this process, as well as immediately following the diagnosis of dementia. Flash is required to view this module. 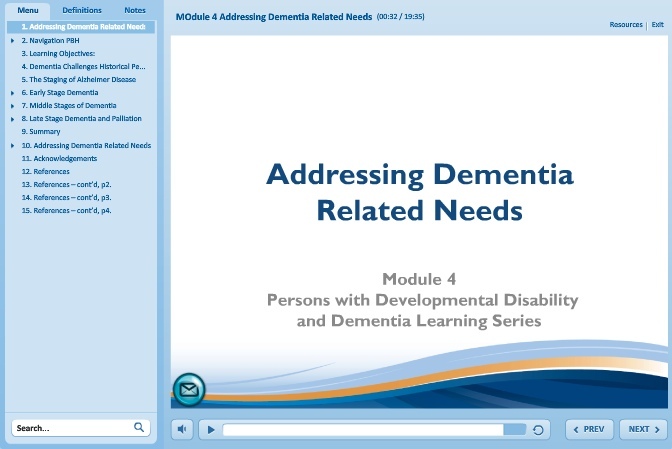 The fourth and final module of this four-part learning series highlights the changing care needs of individuals with developmental disabilities across the journey of dementia, from the earliest signs of cognitive impairment, through the early, middle, late and palliative stages of dementia. Flash is required to view this module. Project Funding kindly provided by the Alzheimer’s Society of BC and BC Ministry of Health with residual funding received from the Grant to Improve Dementia Care in BC. Module Development by: Jel Protection Ltd.